The Gallery. The Gallery is a modern complex located just off the Beach Road in Jomtien on Soi 8. It’s easy to get a Baht bus to Pattaya, or to stroll to the heart of Jomtien to appreciate the food, shopping and other offerings. The low-rise complex benefits from security, CCTV, parking and rooftop pool. 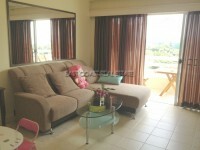 The apartment comes fully furnished including a European kitchen, air con, HDTV etc. Just bring your suitcase! Available for rent for a minimum 6 month rental term.